Probably not, but the Palettes of Vermont project flowered in St. Albans City Hall in January. More than 30 people from all over Franklin County joined folk artist Warren Kimble to kick off individual and group projects in area exhibits and events. The AAC, the Bishop Street artists, the Maple Festival, S.A.F.F., two schools, and individual artists, photographers, writers, and community members were on hand with ideas ranging from a new giant Guinness Record palette to palette crop circles to scrapbook palettes. The Palettes project is a brushfire racing through Vermont including a steering committee in Franklin County. Just two weeks after the official launch at the State House, all 6,000 palettes have been reserved by artists, arts organizations and community groups around the state. The AAC and S.A.F.F. 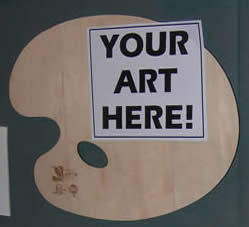 have reserved palettes for area artists in all media. Click here for a reservation form for yours. "We expect to distribute palettes by February 24," Diane Scolaro, Development Director at the Vermont Arts Council, said Monday. The production schedule depends on the Vermont Wood Manufacturers Association. 18 Franklin County artists also signed up to create palettes for the statewide marketing promotion. The AAC and S.A.F.F. will serve as pick-up points for those local artists as well. The Arts Council will package and label each palette with the artists' name plus info about the promotional time line and how to send images of the artwork to the Arts Council. Those packages are available now. The statewide Palettes of Vermont project was made possible with support from Chittenden Bank, Casella Waste Systems, and National Endowment on the Arts, Times Argus, NRG Systems, VermontVacation.com, and Vermont Wood Manufacturers Association, with promotional support from the Vermont Department of Tourism and Marketing.